An energy drink. Dropping a man 24 miles up from space. With the world’s eyes watching. An energy drink. A little over a year ago, Red Bull shook up the content marketing world with its Red Bull Stratos project that revolved around BASE jumper Felix Baumgartner leaping from space to set the record for the longest freefall. Marketers watched in amazement as a brand stuck its neck out to be on the forefront of a risky project and simultaneously bowed down in amazement as 7.1 million viewers tuned in to watch the live feed for the event. In the past, an event such as this would have generated tremendous attention and then left a reputation gap as the brand went back to the drawing board to figure out their next opportunity for an attention spike. Red Bull could have been in a similar situation. The microsite for the project (redbullstratos.com) saw a huge spike in traffic and attention last October around the event, but it was back to minimal traction after the event. But, the difference between Red Bull and most brands is that they have built up a powerful approach to brand publishing and content marketing. They have clearly established themselves as a proven entertainment media outlet and the Stratos project was further affirmation that they are far more than an energy drink company. While many brands today still rely on episodic approaches to campaigns and storytelling to drive spikes in attention, Red Bull is a pinnacle example of how an “always on” approach can drive multiple touchpoints with a target audience on a daily basis and ultimately, help increase brand loyalty and advocacy over time. Through this “always on” approach, brands open up even greater opportunities to continue to escalate campaigns as a brand advocate base grows over time. 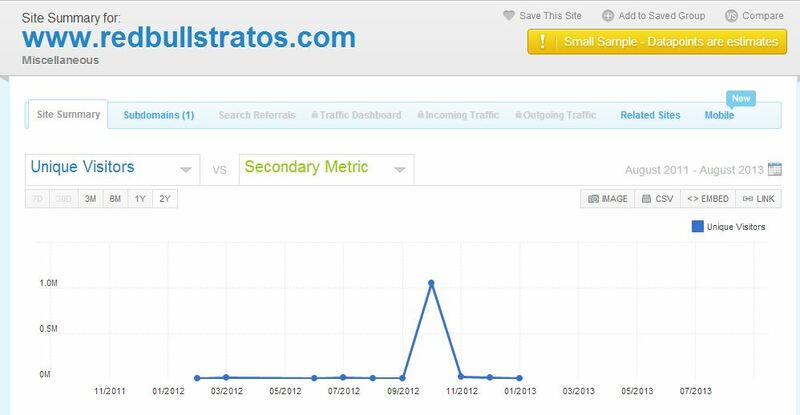 Looking back a year ago, we can see the point at which Stratos helped kickstart an upward trend for Red Bull, leading to site traffic well above a half million unique views each month. Red Bull ditched the product-forward approach that ties so many brands down and has a clear editorial mission to provide entertainment and dynamic, highly shareable content that fuels the interests and values of their target audience of adventure sport enthusiasts. But it doesn’t stop there. Not only do they create entertaining and useful content for a target audience but they smartly embed themselves through owned events that position them as industry leaders. Rather than relying only on traditional forms of advertising alone to drive brand awareness, they know they can engage their audience and position the Red Bull brand smartly by providing valuable content each and every day married with rich offline experiences that helps fuel their editorial approach. As brand publishing buzz continues to seep across marketing and integrated communications strategies, Red Bull’s approach should remain a pinnacle example of a brand that has set the stage for doing it right. They’ve adapted an evolved model that many brands can envision but few know how to implement. Images courtesy of Cyril Attias.